Benjamin Gotow's Layers app for iPhone and iPad has been updated to version 2.2. 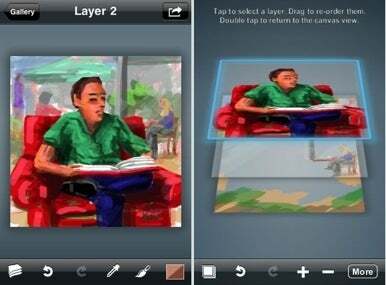 Layers is a painting app that supports multiple layers, much as Adobe Photoshop and similar image-editing programs do. Using layers, artists have a far wider range of creative control over their art. Along with a number of performance improvements, Version 2.2 of Layers sees the addition of per-layer transparency controls, adjustable brush tip offset, and five new brushes. The addition of layer transparency brings Layers closer to Photoshop in terms of basic functionality. This feature allows you to add a layer to your work and adjust its opacity, so you can draw on the layer beneath, or compare the contents of multiple layers by making them semi-transparent. While the iPhone and iPad's touch sensitive screens are great for drawing, thin lines are often hidden by your finger on the screen. The new brush offset feature lets you position the lines you draw up to 80 pixels away from your finger in any direction, making it easier to see what you're drawing. The five new brushes bring the total brush count in Layers to 15, so finding a brush to suit your needs shouldn't be too difficult. And since Layers has the ability to save your art as an Adobe PSD file, layers and all, this app could prove quite useful to both amateur and pro artists. Layers 2.2 is $5 at the App Store and runs on iPhone, iPod Touch, and iPad running iPhone OS 3.0 or later.